Zena has a beaming smile, and she has a lot to smile about! She is an inspiration, and this is why! Zena has turned a small business grant through our IGA program into a stellar success. 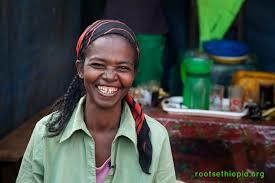 She represents the best part of the work of Roots Ethiopia’s IGA grant program. Our organization holds a campaign every year to put 30 IGA’s into the hands of hardworking women. But your contributions are not limited to the Fall IGA campaign because these women become forces for change in their families and communities as soon as they have the resources to make a difference. Help make an impact and donate now. “I am Zena. I am the mother of 7 children. Before my husband died, my life was very nice. We had everything we needed to eat, everything we needed to live. But after his death, we suffered a lot. After getting some support from Roots Ethiopia now my life has been changed…The program has provided training on how to use the money, how to run a business. Then I started saving after I learned in the training. I am now a business owner and a mother. I sell bread and injera and a local soft drink at the market for 2 days every week. On other days I sell injera at my home. People come every day for my business. The profit of this business is feeding my children, paying house rent, and paying school fees for all of my children. Previous Previous post: Grade Placements in Classrooms in Ethiopia — How does it work?